UK: Cable manufacturer Prysmian and Siemens have been handed a €1.1 billion deal to build an undersea connection between England and Scotland to handle the additional power supplied by renewable energy. 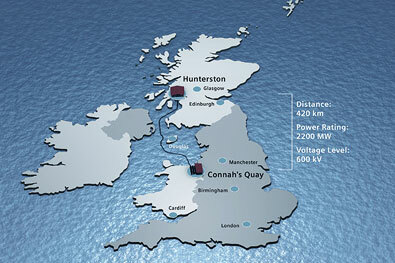 The Western HVDC link will run under the Irish Sea between Hunterston, western Scotland and the Wirral in north-west England. The project's customers are National Grid Electricity Transmission and Scottish Power Transmission. The connection will have a rating of 2.2GW and will be the first undersea interconnect using a DC voltage level of 600kV. Its total length will be 420 kilometres. Speaking about the deal, Udo Niehage, CEO of the Power Transmission Division of Siemens Energy said: "This order to connect National Grid’s and Scottish Power’s transmission networks underscores our technological leadership in the HVDC field by using the as yet unrivaled voltage level of 600 kilovolts for a submarine interconnector with an also unmatched transmission capacity of 2.2GW. "Raising the voltage level in the cable by 20% also enhances its transmission capacity by one-fifth. The transmission losses in the cable are simultaneously reduced by one-third."